A week (and more) without a computer Do iWatch or do iWaitAndSee? A great tragedy happened in the Costa Blanca this month, with the destruction of over 450 hectares of land, most within the Parque Natural del Montgó. At the time of writing the fires are finally fully extinguished, and the damage is being assessed. No one can doubt that the loss is an environmental tragedy on a massive scale, particularly to the nature reserve of the Cabo de San Antonio. But what role does the internet and social media play, in a small community responding to a staggering natural disaster on this scale? For many of us in the local area, Facebook and Twitter were the sources we turned to when we saw the black smoke over the mountain. Jill Leonard’s Fire and Weather Watch Facebook group is an always excellent source of breaking news in this area, making a consistent effort to curate threads of factual and frequently updated information drawn from a wide range of contributors. 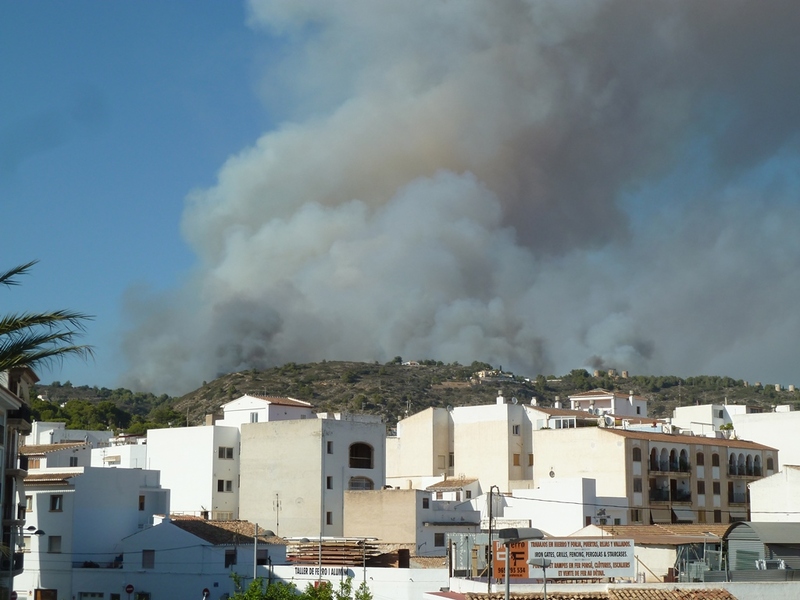 I turned here first for news of the emergency response and evacuation, as the flames rolled down to the dwellings of Las Rotas on the Denia side of the mountain as well as Javea port. As over 400 firefighters battled the blaze through several days of action, sometimes news was hard to come by – because the priority of those involved correctly remained that of responding effectively to events. However the Ayuntamientos of Denia and Javea issued regular bulletins on their Facebook Pages, and the #IFDenia and #IFJavea hashtags were useful to follow on Twitter, for updates in Spanish. But the trouble is with an event of such impact and magnitude, it’s easy for inaccuracies to circulate. Add to this the visual nature of media like Facebook, because let’s face it dramatic photos of burning buildings and hillsides are highly shareable by their very nature. When you see something shared repeatedly it’s easy to assume it has some validity and pass it on yourself, but this can lead to all sorts of problems. 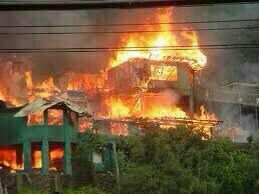 For example, my teenage daughter shared close-up mobile video footage and captioned it simply ‘Horrible fire on our local mountain…’, without mentioning that she didn’t shoot it, wasn’t anywhere near it, and it was nowhere near our home. Friends and relatives particularly those in the UK responded with great anxiety fearing we had been roasted alive, and a conversation about appropriate contextualizing and attribution of sources when sharing media ensued in our house thereafter. Another dramatic image was seen a great deal that first night, especially when the Ayuntamiento de Denia issued a statement that two homes had been burned – a picture of a blazing building with a green stone frame. I saw it all over Facebook, Twitter, Whatsapp and various news aggregators… but it just didn’t look like Denia, and indeed a Google Image Search the following morning indicated it was first published over 18 months previously… in Peru. I don’t know where it started… But that picture spread nearly as fast as the fire itself on that first night. So of course did the speculation as to the cause – even before the flames were out, theories were being advanced: arson, a co-ordinated attack, fueled by images appearing to show plumes of smoke coming from several locations simultaneously in the early stages of the fire. All we know for certain at the moment is that concrete answers from an investigation are a long way off – and anything else is guesswork at this point. Again this doesn’t stop rumours and inferences continuing to be shared spread as though they were facts, when there really are not. Of course lots of very heartening things did happen on social media including the rallying of the expat communities offering help – local kennels opened their doors to animals displaced in the evacuation, and offers of food and accommodation poured in from around the coast, in fact out of all proportion to need – expressing a community desire to respond and help, to rally round and be of service. Since the flames have been extinguished a further wave of expat support is emerging to organize fundraising events and appeals, to support uninsured victims of the blaze, the work of the emergency services, and to campaign for the restoration of the area. At the time of writing debates are ensuing as to the appropriate form of response here, as many are keen to avoid the planting of pines which are not native to the ridge, wanting to see more traditional and resilient species reintroduced. A page to co-ordinate these discussions and efforts has grown rapid support at MontgóViu and they also have a good collection of video and photo resources indicating the extent of the damage that was done. Drone footage of the blackened hillsides are a dramatically depressing sight, but equally showcase the incredible work of the emergency services in minimizing damage to property – indicating preserved villas literally surrounded by blackened stumps right up to their boundaries. Further hopefulness is being spread by before and after images of the hillside on the western flanks of Montgó, ravaged by fire in May – and already greening back visibly despite the dangerously dry summer.